 AWAY TO CANADA (Anon/Stephen Foster) The words to this song were published in a newspaper for the Black community, The Voice of the Fugitive in Windsor, Ontario in 1851. Windsor was one of the main Canadian entry points for slaves from the United States who were escaping on the Underground Railway. This was a network created by Abolitionists to assist slaves who were willing to risk their lives to get to Canada where a form of freedom was available. The Parliament of Upper Canada (as Ontario was then called) passed a law in 1793 that banned the sale of slaves and intended to phase slavery out of existence in the colony. In 1833, the other Parliament in England abolished slavery throughout the Empire. From 1850 to 1860, thousands of slaves escaped into Canada where they were free from their former masters under British law. Appropriately, the tune for the song is American! RATTLE ON THE STOVEPIPE (Trad. Canadian) This song was collected by Edith Fowke from LaRena Clark. It appears to be related to the Riddle Songs. Apparently there is a somewhat different version in the USA and some of the verses turn up in other songs. CHAIN COTILLION (Trad. French) Cotillions were a type of social dance that originated in France and became very popular in England and her colonies in the 18th Century. It is where the band gets its name. This tune may be of French origin. There is a two part version in the MS of the Bosham Band form Sussex in the mid 19th C and it also appears in other sources such as Aird 3. In the Anon7408 MS it is called by the title, “La Nouvelle Hollendoise”. In S. Dawes (1818), it is known as “La Louise”. It also appears in early American manuscripts, which demonstrates that it was a popular tune on both sides of the Atlantic. This four part version was introduced to us by Robin Harrison, musician for the Toronto Morris Men who found it in a manuscript of French dance tunes.